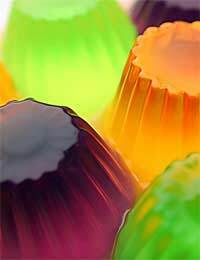 Making and eating jelly can be great fun for adults and children alike and there is certainly no shortage of sugar free options to enjoy.Jellies obviously need to be made well ahead any occasion you plan to serve them up at, as they need plenty of time to set.Play around with these recipes, adding extra fruit etc for variety. A well-made jelly always looks fantastic - and should be delicious too. This recipe calls for two pints of sugar free apple and raspberry juice (ideally, pure juice that has not been made from concentrate). But you could try it with basic apple juice or even sugar free blackcurrant drink. Take about half a pint of your apple and raspberry juice and heat gently in a small pan with your gelatin leaves. Stir until completely dissolved. Slowly stir in the rest of your juice. Add a few drops on red food colouring if you would like to make the jelly a little more vivid. Pour into your jelly mould. Leave to cool, then place in the fridge over night. Turn out the following day on to a large plate. Decorate with fresh raspberries and serve with sugar free vanilla ice-cream. You can really go to town with this sugar free jelly, adding whatever fruit you like to it. Small chunks of pineapple and pieces of peach and nectarine work well. Take about a quarter of your fruit juice and heat gently in a small pan with your gelatin leaves. Stir until completely dissolved. Peel and remove the stones from your tropical fruit and cut into very small pieces. Then stir it into the liquid gelatin. Little by little, add the rest of your fruit juice. Pour into your jelly mould. Leave to cool, then place in the fridge over night. Turn out the following day on to a large plate. Decorate with fresh fruit of the same type that you have included in the jelly - pineapple rings look good. Serve with fresh cream. This is definitely one for the grown-ups. Add vodka to a strength that you enjoy - but don’t overdo it! Wash and dry eight to 10 glasses. Take about a quarter of your cranberry juice and heat gently in a small pan with your gelatin leaves and granulated sweetener. Stir until completely dissolved. Remove from the heat and slowly add the rest of your juice. Squeeze your lemon and add a tablespoon of the juice to you mixture. Pour in you vodka and stir again. Leave to cool slightly before pouring into your glasses. When really cool, place in the fridge overnight. For fun, serve with a slice of lemon on the edge of each glass.